Yelp might still be the most recognizable name in crowdsourced online reviews, but it may be hitting a wall in terms of audience growth as it faces increasing competition; all the while, the company’s stock price remains less than half of what it used to be. All of this might explain why the company is reportedly looking to find a buyer for its multibillion-dollar business. According to the Wall Street Journal, Yelp has recently been meeting with bankers and possible buyers, though no names are mentioned. The company could fetch $3.5 billion or more. While the Yelp site attracts an impressive 143 million unique visitors each month, the audience appears to be growing at a slower rate. The year-over-year number of monthly visitors increased 8% in the most recent quarter. 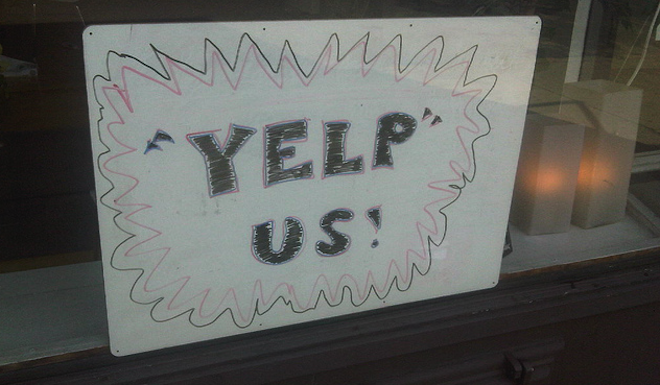 Compare that to a year ago when Yelp’s user base had soared by 30%. Competing services, like the network of review and hotel/restaurant/travel booking sites under the TripAdvisor Inc. and Priceline Group umbrellas, give users both the ability to research businesses and make purchases. Given the vast variety of business types reviewed on Yelp — everything from coffee shops to dry cleaners to hardware stores to contractors to prisons — it would be difficult, if not impossible to add that sort of one-stop functionality across the whole site. But the site’s mammoth review database, built-in audience, and famous brand will still make it a tasty target for some bigger company. After going public in March 2012, Yelp’s stock price increased peaked two years later at $97/share. Then came an April 2014 report that the site had been the subject of thousands of complaints to the Federal Trade Commission, which cut the share price almost in half. The stock recently sank to $39, its lowest price since July 2013. A federal court recently dismissed a class action lawsuit by Yelp investors who alleged that the site misled them about the quality of the reviews in order to inflate the share price. Next When Is A Treehouse No Longer Just A Treehouse? Next Up: When Is A Treehouse No Longer Just A Treehouse?